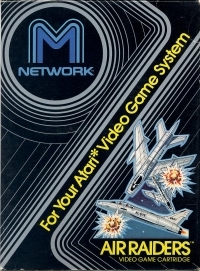 Description: This game was originally called Air Battle while it was in development, and at least one prototype has been found with an "Air Battle" label. 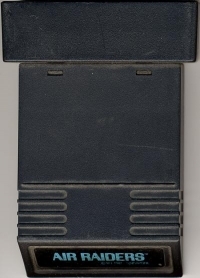 The prototype label is white with black text similar to an INTV label. 10-13-2012 exonerator Description This game was originally called Air Battle while it was in development, and at least one prototype has been found with an "Air Battle" label. The prototype label is white with black text similar to an INTV label. 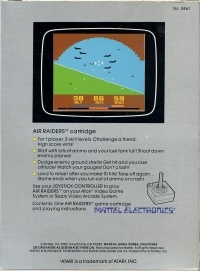 This is a list of VGCollect users who have Air Raiders (black label) in their Collection. This is a list of VGCollect users who have Air Raiders (black label) in their Sell List. This is a list of VGCollect users who have Air Raiders (black label) in their Wish List.